Please visit our Facebook page to view more photos by clicking on the icon at the bottom of page! Please keep checking our website and Facebook page, as we will be adding new adoptables SOON!! Meet Chico! Chico is a spunky little Chorkie (Yorkie/Silky/Chihuahua) who is around 2 years old and weighs in at a whopping 5 pounds! Being a quick study, he knows some basic commands like sit, stay, and drop it! He is full of personality and although Chico loves to play with others, he can get a little bossy! He would be best as an ONLY DOG in his new home. Due to some past experiences, he has a very tender heart that attaches easily, which makes it difficult for him to share his human with other pups. Yelling and loud noises make him nervous (his feelings get hurt quite easily), so he would prefer a quiet home where he can lay on laps and get all the snuggles...that's his favorite thing! Weather permitting, he loves to explore outdoors and since chasing squirrels (and cats) is his specialty, a fenced yard is a must! Chico does great with outside potty as long as he can remain on a schedule and he tolerates his kennel for short periods of time but at his recent fosters home, he has free roam during the day and has had no incidents! He is also current on vaccinations, neutered, and microchipped. If interested in meeting this dapper gent, please fill out an application and we will be in touch! $400 for a lifetime of love! please fill out an application and we will be in touch! and 6 years old. Both are very sweet boys who are a bit shy and timid at first, but warm up to people quickly. They have fantastic personalities (as you can see by Bos' favorite down dog pose) and are very playful! Like their brother Jerry, they do well with their foster fursibs but do NOT prefer the company of cats! They require a fenced yard and a home with older children (if any) who have experience with small dogs, due to their petite size. Their current foster family has very responsible and gentle kids and they LOVE them! They are pad trained and do well with potty as long as let out on a regular schedule. They are also crate trained although they have free-roam of the kitchen while their fosters are gone and they haven't had any issues so far. These boys are current on vaccinations, neutered, and microchipped. If interested in this dynamic duo, please fill out an application and we will be in touch! $550 for a lifetime of love! and although he looks much heavier (he has a very thick coat), Jerry only weighs apx. 11 pounds and is all Chihuahua--right down to his quirky personality! This little potato, as his foster calls him, likes to be greeted slowly but once he knows you, he LOVES to cuddle! older children (if any), a fenced yard, and would even love it if his human could take him on short walks during comfortable weather. He is house and crate trained, current on vaccinations, neutered, and microchipped. If interested in meeting this little nugget, please fill out an application and we will be in touch! a home with existing dogs in order to continue to have a role model on how a good puppy should behave and allow him to further develop his confidence. Ember and Ash will come to their new home(s) neutered/spayed, microchipped, and up-to-date on all age appropriate vaccinations. They will be available for adoption in a few weeks after they have been vetted. If you are interested in meeting one or both, please complete an application from our website and we will be in touch! Meet Lillith (Lilli)! Although she resembles a Chihuahua, she is actually a Smooth Coat Russian Terrier! They are very un-common in the United States and this sweet girl came to us from a state licensed Puppy Mill in Texas...we are extremely happy she is out of that horrible place. Lilli is 6 years old and while she is a little shy at first, she is very quick to sit on your lap when she is comfortable with you. She has a ton of personality and loves to play with her toys (her favorite being make-up poufs)! Lilli gets along great with cats and her small 4 legged foster siblings but is not fond of bigger dogs. Because she is such a delicate flower, small children make her very nervous so a quieter home (with older kids if any) would suit her perfectly. She is learning to enjoy short walks on a leash and loves to chase birds and squirrels in the back yard...a fenced in yard would make her extremely happy! Lilli is crate trained and currently sleeps in her kennel at night but would LOVE to be snuggled up by your side in bed! She is also potty trained and is doing great being kept on her potty break schedule but she will let you know when it's time by going to the door. Lilli is also spayed, microchipped, and is current on vaccinations. If interested in this little doll, just fill out an application and we will be in touch! Meet Nico! Nico is a four year old male dachshund mix who was originally adopted out from Revolution Rescue in July 2016. He was returned to us in December 2017 after he became paralyzed and was diagnosed with Intervertebral Disc Disease (IVDD). Nico weighs seventeen pounds and is a happy little guy who is loving life and isn’t phased by the fact he can’t walk. He is currently receiving acupuncture, chiropractic treatments and taking a couple herbal supplements for his IVDD. He loves going for car rides and taking walks in the neighborhood in a set of wheels. He prefers not to use the wheels at home as he can get around very well without them. Nico has a few exercises he must do to help him gain strength in his rear legs…it’s working as he recently has taken a few steps! He has lost his bladder and bowel control, so his foster mom expresses his bladder a few times a day. Don’t let this scare you as it’s very easy to learn and Nico doesn’t mind it at all. He does wear a belly band when he’s scooting around the house to help with accidents. Nico gets along with most dogs and cats but will chase a cat if they run as he thinks they are playing. He enjoys playing with other dogs and is constantly trying to get his foster fur siblings to play with him. He loves to be with his foster mom, shower her with kisses and follow her everywhere. Nico is looking for a patient, loving family that will continue with his treatment plan and love him regardless if he’s able to walk again or potty on his own. Nico is current on vaccinations, neutered and microchipped. If you are interested in adopting Nico complete an application from our website and we will be in touch. $225 for a lifetime of love! Meet London! London will be up for adoption but she's not quite ready yet as she is currently gaining confidence in training! She is a Pit Bull mix that was scheduled to be euthanized in a Kansas shelter due to being fearful and for a lack of space. We did not know London was pregnant at the time we pulled her from the shelter (in fact, we were told she was Heartworm positive) and since that time, she had given birth to 7 puppies that have all found their forever homes! Stay tuned if interested in London, and we will put her full bio up when she is ready for her forever home! Meet Brizzket! This little cutie is a 7 year old brindle Chihuahua who weighs about 12 pounds. 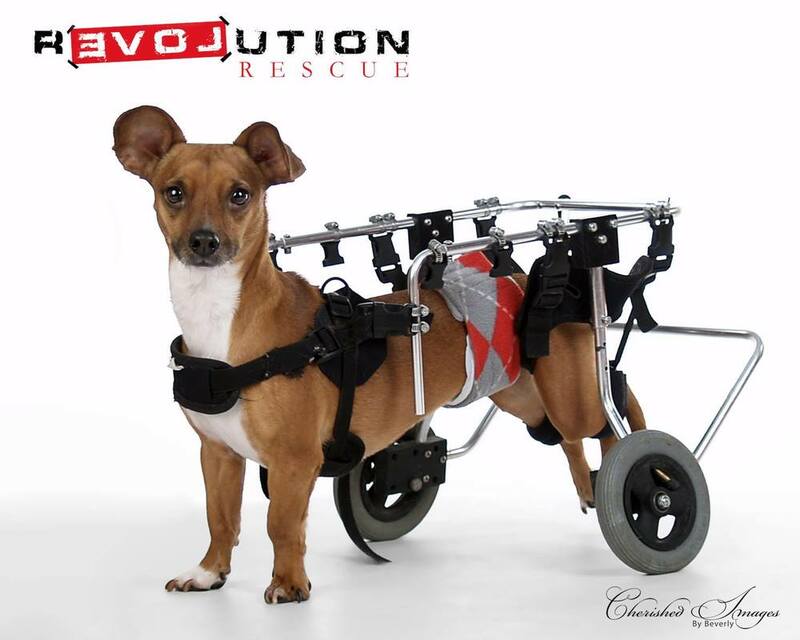 He came to Revolution Rescue from a Kansas shelter where he was at risk of being euthanized after his owner had surrendered him. It's our understanding that he was kept outside at all times and had little to no human contact or handling. He is a little shy upon meeting new people and for that reason, it would be best he go to a quiet, patient home that will give him the space he needs to adjust, and a fenced yard is required. Brizzket gets along well with other dogs his size, he has no issues with cats, but would do best in a home without children. an application and we will be in touch! Meet Leia! Leia is a 12 pound Chihuahua who spent the first 9 years of her life in one of the "horrible 100" puppy mills in the Midwest. She is very shy at first, as she is learning that humans can be kind and good after spending years in an overcrowded cage with limited positive human contact. Leia has learned to trust her foster mom and showers her with kisses, but she will need a home with calm, patient humans who are willing to allow her to progress toward trusting them at her own pace. She enjoys other low energy dogs her size and also gets along well with the cats in her foster home. Leia is doing well with potty training as long as she is taken outside regularly. She is learning to walk on a leash and requires a home with a fenced yard (non-negotiable) to allow her to continue with this training and explore her world in safety. Since she often takes the lead from other dogs' behavior, she would do best in a home with another dog or she'd love to be adopted with Princess or Chewie, who she loves to cuddle next to in her foster home. Leia has a heart murmur which she takes an inexpensive medication for once a day. She is spayed, current on vaccinations, microchipped and recently had her teeth cleaned. If you are interested in meeting her, complete an application and we will be in touch!